It happened when Muslim Fulani herders targeted villages in the Christian region of Maro, in Kajura County of Kaduna state on 26 February. Church buildings were also damaged and missionaries working in the local area of Adara were displaced, alongside Katari ethnic groups. 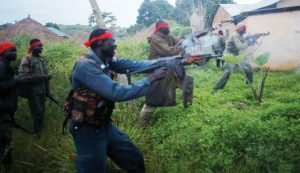 An earlier attack on 10 February by herdsmen left ten Catholics and an unborn baby dead in Angwan Barde, in the same county. Nigeria’s Christians also live in fear of kidnapping, violence, and death from the Islamic jihadist militia Boko Haram. The ACLJ (American Center for Law and Justice), is presenting a critical oral intervention at the UN’s Human Rights Council, urging the world’s leaders to act. As reported last issue, Boko Haram abducted 15-year-old Leah Sharibu and are threatening to enslave or kill her if a $275 million ransom is not paid. “Leah’s heartbroken parents are begging for prayer, and for help,” reports the ACLJ.